Apple has quietly rolled out some new changes to its electronics recycling program, which now allows you to recycle computers or displays from any manufacturer for free. Enabling you to recycling your old hardware through and Apple store even if you are not upgrading or purchasing a new Apple product. 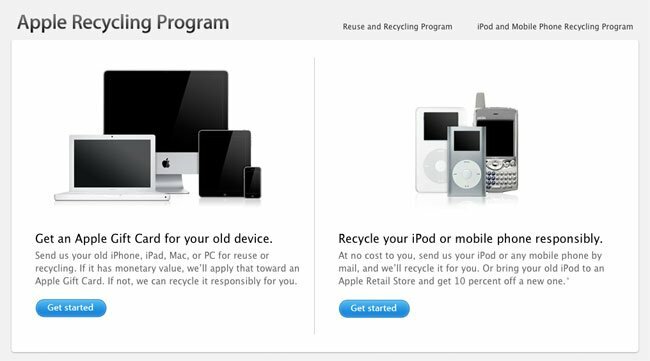 The latest updates to Apple’s recycling program also offers Apple gift cards rewards in exchange for your old hardware and will no longer charge you to recycle your goods as it did before, if your hardware is to old to be worth anything and you were not purchasing an Apple product. The new recycling program also lets you recycle old Apple iPods cellphones via mail, however you won’t receive a 10% discount unless you drop in to an Apple retail store. You can find out more information on Apples latest electronics recycling program by visiting their website.